for footwear this Fall as I sit here during another storm!! Shoes are the exclamation point to every outfit. Basic is boring don'tcha know!! ...come on, I know you love them all !! ...hope this is as good. 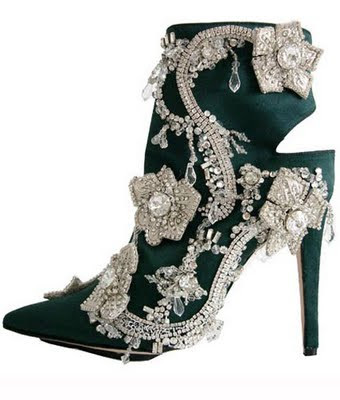 Design your own dream shoe today!! 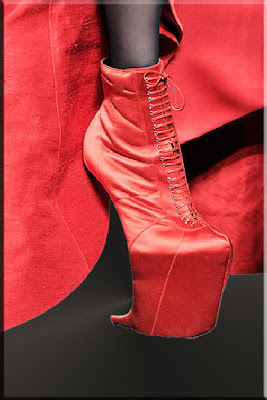 I would surely break my neck if I wore those shoes, but I'll take my chances! Wow, they are gorgeous!! 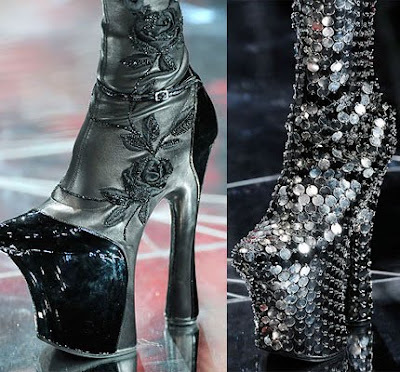 I'll take the jewel incrusted boots in the second photo please! I'll take them all! Fabulous! But where are the flip flops? Do these designers not know what's REALLY important? I'm just glad I live someplace where I can actually wear flip flops all year long if I want to. Of course, when I lived in Chicago, I still wore inappropriate shoes, like clogs in the snow. Oh well. Ah, I think I'll have to take a pass on them all. I prefer not to break an ankle at this time,LOL! Except for the Prada's. There are some keepers in there! Nerina... oh, honey! I could have worn those in my college days, but it hurts to look at those uberspikes now. LOL! And what is with the soles on some of the shoes being so hideously thick? They look like they were designed for Quasimoto. ;-/ But this was fun to see. I believe if I'm forced to choose, I'll take the ones with all the bling. A magpie loves shiny objects. I'll wear them if I can just stay seated! Preferably at home. Oh it's got to be the black CL laceup boots, how totally cool. Ooooo Ooooo.... the Louboutans and the Pradas, those are my faves. But I am also a big fan of the Posens.... so many choices! Love, love, love them all...could walk in none of them! :( LOL! These are amazing! Can't begin to pick a favorite. Got to be the Manolos for me for the weekly supermarket shopping!! thanks for visiting my blog and commenting on my book and work. i appreciate hearing that!i agree, why does Ontario need to be so far away from New Jersey? love all these funky shoes! Thank you for the lovely comments you left on my blog! I love the Malono shoes. They are so gorgeous. The Prada shoes aren't bad either! A girl can dream, can't she?!?! ?